Approximately every five years since 1988, members of the studio have created a new print portfolio. Now numbering seven, the debut of each portfolio generated great public interest. Six of the portfolios have been purchased by the Boston Public Library and The Art Complex Museum in Duxbury. Two portfolios are in the collections of Wheaton College and The Worcester Art Museum. 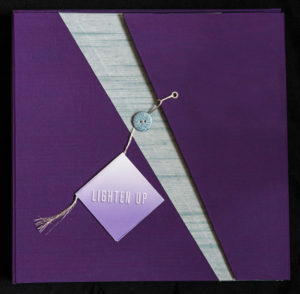 Most recently, Lighten Up and Sub Rosa, the sixth and seventh portfolios, were exhibited at The Art Complex Museum in Duxbury. And Sub Rosa was exhibited at Curry College in Milton. Although the individual portfolios vary greatly in theme and format, each box contains a curated collection of prints by many artists, demonstrating various printmaking techniques and interpretations of the theme. The portfolios were designed to be easily assembled and displayed in a gallery setting. The collaborative nature of this work offers the studio members an opportunity to connect as a cohesive group and to represent their work together as an archive. 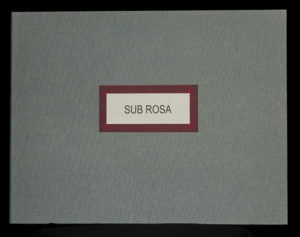 The theme of Sub Rosa offers a broad interpretation of veiled, surreptitious or hidden experiences. Many of the images are mysterious and allow the viewer to rely on their own interpretation. All prints are 11×15 inches on Rives BFK paper. Each artist produced an edition of five with one artist’s proof. The concept of light or “to lighten up” allowed for many interpretations including, but not limited to, using color of various intensities, the play between dark and light and the feeling associated with a lightness of being. All prints are 11×11 inches and are printed on Rives BFK. Each artist produced an edition of five with one artist’s proof. All the prints in this portfolio involve the number three—triples, triads and triangles—in areas such as nature, science, visual patterns, music and religion. All prints are 14×11 inches and are printed on Rives BFK. 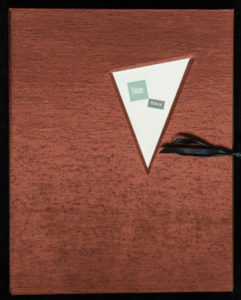 Each artist produced an edition of five with one artist’s proof.